Building a home addition is a major undertaking. Screw it up and you could suffer financially and emotionally and never end up with the home addition you dreamed of. Read my seven important tips below on how to build a home addition the right way. The first thing you need to do when planning a home addition is to grab a sheet of paper and pencil and write down what you want to achieve in your new room addition. Write down how you plan to use the new space and your goals for size, features and budget. Rank the list of items in order of priority so that you can develop your home addition plans in a way that makes the most sense for you. Next visit your local building inspector to understand all of the building codes and rules associated with your municipality and state. Bring along your property plot plans and a high level sketch of your home addition plans. At a minimum, have an idea of how large the home addition will be and the location of it, relative to your existing home. Most municipalities have building height restrictions, property line and easement setbacks, and building area ratios relative to the size of the property lot. The building inspector can also tell you about any building covenants or other restrictions that may be specific to your property lot. You’ll also need to pull the necessary permits prior to breaking ground on the home addition. Plan to visit the building inspector again once you have a full set of plans in place and are ready to start construction. Let your creativity juices flow when planning your home addition. For example, instead of a simple square or rectangular addition attached to your home, add a jog or two in the addition footprint to create some interesting architectural features in the home addition. 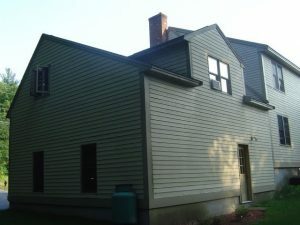 Alternatively add some interesting angles to the home addition footprint to help soften the connection of the addition to the home. Also consider spicing up the roof line to create some interesting exterior aesthetics. Make sure, however, to use the same roof pitches as used in the main home. Slight difference in roof pitches between the home addition and main home can look unsightly. Work with an architect to help create both a functional and interesting home addition that melds well into your existing home. Make sure you home addition doesn’t end up becoming a behemoth globbed on to the side or back of your existing home. The home addition should be scaled appropriately with the existing home. A home addition should be functional, efficient, and meld in aesthetically well with your existing home. In the end, the interior of the home addition should be functional and the exterior of the home be aesthetically pleasing from the curb. Again, an architect can help to address all of these concerns. Make sure to design your home addition so that it follows the natural contour and slope of your property. If for example the property slopes away from the existing home, strategically step the home addition foundation walls down. By stepping the foundation walls down at one or two points along the length of the foundation walls you can ensure that you don’t end up with a massive foundation wall penetrating out from the ground. You may want to try to match the home addition exterior with the same exterior surface and color. Alternatively, you may want to use a different material or colors that contrast and complement the existing home. Choose wisely. You want your new home addition to aesthetically meld well into the existing home. Otherwise you may end up with an eye sore that looks like an albatross attached to your home. Make sure when building your home addition and generating your home addition plans to consider landscaping. When complete the surrounding soil grade should slope away from the home addition, as well as the home. 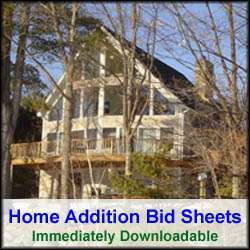 Also, you may want to include flower beds, walk ways and other landscaping features into the actual home addition plans. Also, make sure you budget and plan for the work to be completed near the end of the home addition construction. Follow these 7 expert tips on building a home addition and you’ll be sure to have a successful home addition building project.